The 2013 Golden-cheeked Warbler Symposium was held Jan. 25 in Austin and hosted by Biodiversity Works. The symposium was also sponsored by Bandera Corridor Conservation Bank, the Texas A&M Institute of Renewable Natural Resources (IRNR), and Zara Environmental LLC. Researchers from IRNR and Texas A&M University participated in the symposium and presented on a variety of research projects, including warbler habitat credit trading, management guidelines, use of distribution models for conservation planning, breeding habitat and warbler responses to human disturbances. 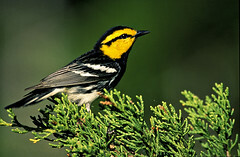 The golden-cheeked warbler is a migratory songbird that breeds exclusively in central Texas. It was listed as endangered by the U.S. Fish and Wildlife Service in 1990 due to habitat loss and fragmentation. More information on the symposium and the presentation files are available online.